A former site of an astronomical observatory of Aizu Clan School Nisshinkan in Aizuwakamatsu, Fukushima Prefecture, has been officially recommended for astronomical heritage listing in Japan (see below), a list that was created this fiscal year by the Astronomical Society of Japan. The site is the oldest remains of an astronomical observatory among existing ones in the nation. If designated, the site will become the first on the astronomical heritage list. Representative members of the astronomical society are scheduled to decide which sites will be given designations at a general meeting to be held in late January. Though the astronomical society does not disclose details about recommendations of astronomical heritage sites, the former site is believed to be the only one recommended that is located in Fukushima Prefecture. Junichi Watanabe, 58, vice director general of the National Astronomical Observatory, recommended the site for the heritage list. The Aizuwakamatsu native emphasized the significance of the nomination, saying: "It is the only place where a former site of an astronomical observatory dating back to the Edo period (1603-1867) remains. It is an extremely precious historical site that indicates how high the cultural level was in those years." Watanabe said that astronomical observatories in the period were also built in such major feudal domains as Hirosaki, Mito and Satsuma, but the number of them in those years was "around 10 at the most." 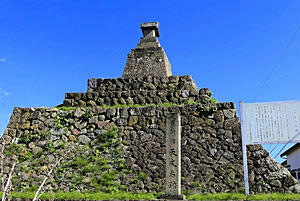 Except for that of Nisshinkan, remains of those astronomical observatories no longer exist. Nisshinkan's astronomical observatory was built by the Aizu domain in 1803 almost simultaneously with the construction of the domain's school. It was 6.5 meters high, and about half of the structures from the period still remain. In the Aizu domain, astronomy advanced after Hoshina Masayuki, the first lord of the domain, ordered astronomer Shibukawa Harumi to make a calendar system. The domain school held classes, including astronomy. "The former site proves that the Aizu domain placed importance on not only martial arts, but also academic studies," Watanabe said. Concerning the former site, there is a move that is aiming for registration as UNESCO's world heritage site of astronomy. Kenichi Usuki, 51, former head of Aizu Tenmon Dokokai, a local association of astronomy fans, represents a project for promoting preservation of the former site. "If designated, it will give a boost to the activities to preserve the former site. I want it to become a place that attracts attention from both inside and outside the nation," Usuki said. The heritage list was created by the Astronomical Society of Japan in an effort to preserve historical heritage in astronomy and astronomy specializing in calendar and pass them down to future generations. Members of the society recommend nominations for heritage listing, its selection committee examines the recommendations, and finally the society's representative members approve designations at their general meetings. Themes of the designations fall into three categories -- "historical sites and buildings," such as architectural structures and observation facilities; "items," including observation equipment and measurement devices; and "reference," which are, for example, documents.